This royal coat of arms, of carved oak, is supported by two angels. The arms were used by both the Plantagenet and the Tudor dynasties of English monarchs. It may have been made in France or England. 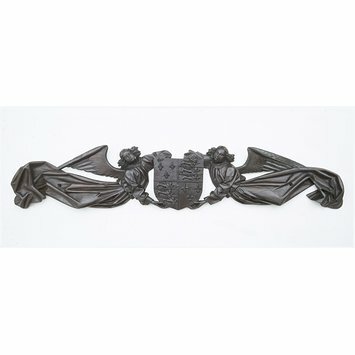 The style of the piece is late Gothic, and there are parallels in Northern France, Germany and The Netherlands. As yet, there are no signs of the classical influence that would have prevailed at the time in central Italy. Closer to home, there is a similarity between the massive angular folds of the angels' draperies and those of the angels on the tomb of Sir Edmund Gorges in All Saints, Wraxall, Somerset (about 1520). The poses of the angels, in an S-curve, are similar to those of angels on the tomb of Sir Richard Knightley (died 1534) in St Mary's, Fawsley, Northamptonshire. Probably made in England or France. An almost identical pair of angels, but supporting a different shield,and the whole carving painted and gilded, is at Knebworth House, Hertfordshire,in the State Drawing Room, illustrated in the guidebook, 2005, p. 39. 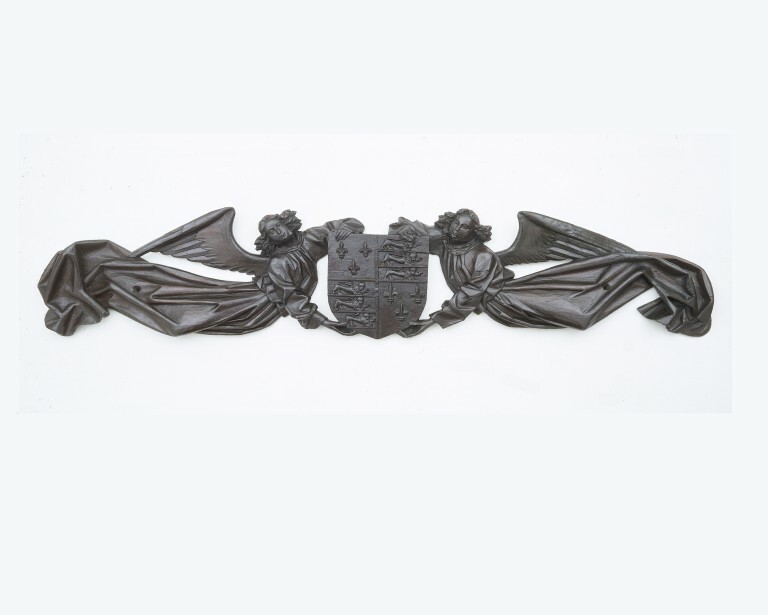 This suggests that both carvings may have been in the antique trade in London in the 1840s, when Crace was creating his antiquarian interiors at Knebworth. Charles Tracy, English Medieval Furniture and Woodwork (London, 1988), cat. no. 269. 'Shield or Arms, carved with the Royal Arms of England, as borne by the Plantagenet kings, supported on either side by a winged angel ﬂying horizontally and wearing a long ﬂowing robe (PL.90). This is sculpture of high quality, and in view of the eccentricity of the heraldry (the lions passant guardant are facing in the wrong direction), could just as easily be French as English. However the bulky angular folds of the drapery can be matched on the angels in the early sixteenth-century tomb of Sir Edmund Gorges at Wraxall, Avon (FIG.54).The rhythmic swinging S-curve of the ﬁgures is echoed in the slightly less accomplished but stylistically related ﬁgures on the tomb of Sir Richard Knightley (d.1534) at Fawsley, Northants'.